Transit in Houston could be getting a dramatic makeover, covering a much greater area and significantly boosting ridership — and running it won’t cost any more than running the current system. 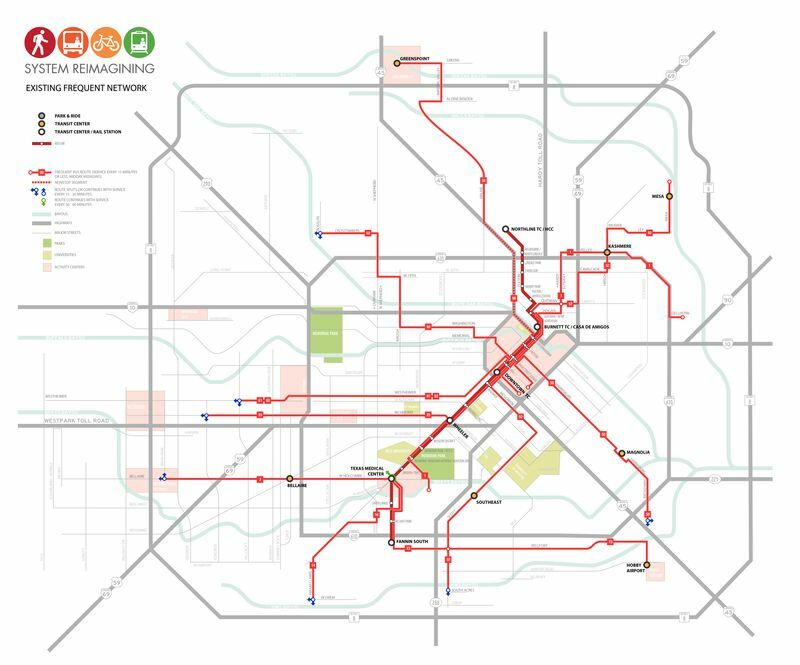 Houston’s Metro transit teamed up with TEI, a Houston-based transportation planning firm, and transit consultant Jarrett Walker, who blogs at Human Transit, for an overhaul of its bus routes. The proposal they put together would greatly expand where people can get to in Houston using frequent transit service, all without increasing the system’s operating budget. The same operating budget could run a system that looks like this. Map: TEI/Asakura Robinson Co.
1. That’s how much waste there was in the existing system. Waste in the form of duplicative routes, and due to slow meandering routes created due to a few people’s demands. The whole geographic focus of the network had to shift. Houston is one of the biggest US cities that still has a radically downtown-oriented transit network despite decades of decentralization. The core area where the existing network converges has only 25% of the region’s jobs, and while transit must favor the jobs that are in dense and walkable settings, there are now many highrise clusters around Houston that answer to this description to some degree. Houston has been growing mostly westward and northward in the last few decades. Its densest residential neighborhood, for example, is Gulfton, located 7 miles west of downtown. Not far from there is its second-densent employment and activity center, Uptown-Galleria. Houston is a constellation of centers, and the transit network needs to be more decentralized to effectively service all of those centers where the density and walkability make transit viable. The high-frequency grid, shown above, reaches all of those places. The new service plan is not a done deal. Houston Metro will use feedback it receives on the new design before determining whether to move forward. Elsewhere on the Network today: Seattle Transit Blog reports that weeks after the defeat of a transit ballot issue in Seattle, city officials seem to have settled on a way forward. Better Institutions examines what $400 billion in highway trust fund spending since 2005 has gotten us. And Pedestrian Observations discusses how different suburban forms are suited to different types of transit.